A week or so ago, I started fooling with the idea of a mini-game called Manbot Warriors based on a Saturday morning cartoon show that never existed. I like the idea of a little 6×9 booklet, short and to the point, played only with normal dice (i.e. d6) that people could take on trips or pull out on a rainy day and have fun with. Cost should be minimal – maybe $6 or $7 for a book and a couple bucks for a PDF. 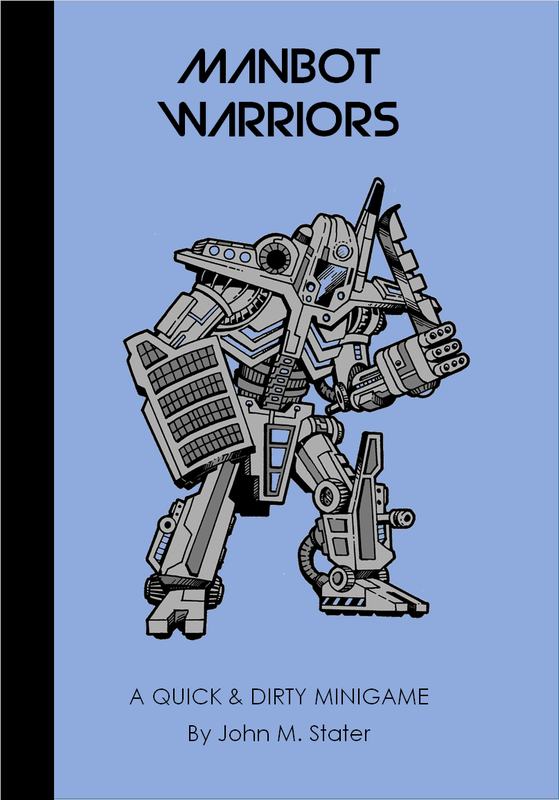 Well, Manbot Warriors is getting some play testing and I already have a first draft being printed at Lulu so I can see how I did on the technical side. I’ve also worked up a rough draft for a Greco-Roman fantasy mini-game called Swords & Sandals – based more on old Hercules and gladiator movies than actual history, of course. Hippie Hijinks – inspired by the old Fabulous Furry Freak Brothers comics I inherited from a friend (I was always a Fat Freddy’s Cat guy myself) – sneaking into Disneyland, fighting “The Man”, etc. Astronauts & Aliens – I’m thinking a 1960’s, space age game of Astronauts (and Cosmonauts as well, I guess) exploring alien ruins on the moon. The technology would be “of the time”, so no ray guns and such. Don’t Go In There – Horror RPG – party of normal folks being stalked by a monster or slasher or whatever. 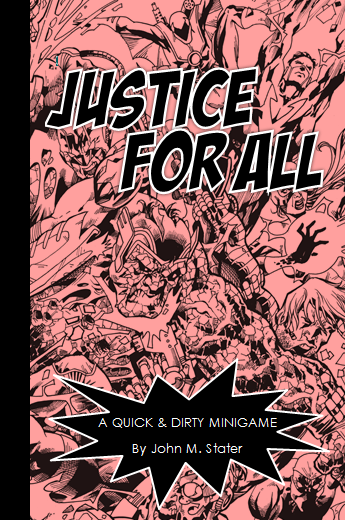 Might try to do this one for the next issue of NOD and include it as a mini-game for the Halloween season. B for Barbarian – I’ll probably change the name, but I wrote this mini-game a year-or-so-ago and will definitely publish it in the 6×9 format. Pen & Paper Football – Not quite the same, but the rules for the mini-game I published in NOD a few issues back. This is a no-brainer, so it will definitely happen at some point. I did a poll with five of these on Google+, and Deviant Decade and All-Out War were the most popular (which is cool, since I figured I’d be writing them soon anyways). Let me know which one’s spark your imagination. I’ve also considered doing a combo of easy rules with actual short adventure included, something like the one-page dungeons. Remember – if you’d like to submit something to NOD, please contact me – email in the column to the right. I'd buy pretty much all of those. A thousand times YES! I love the Emergency TV show (and Adam-12). I recently re-watched the entire series. I have also been tinkering with war gaming a rescue show with 1/32 plastic firemen and cops. I would love an RPGs version. The others would likely get my money as well, due to nostalgia for the mini RPGs of the 80s. BTW, per previous post, don't change a thing about Space Princess, I love it as is. Academy Blues – you are your buddies are police cadets in Future City. Sneak out after curfew, train to get your blackberry and drive a flying car, go on missions and earn karma from the cyborg instructors. Graduate! Golem Grinders of Gomorrah – you and your buddies are priests of decadent gods in the original city of sin. Design your golem and have it fight for you in the city's arenas for moolah. Have it protect on the way back to temple so you don't get mugged. Rock City – you are a corrupt or reputable cave man politician. Convince other cave men to follow you. Invent things. Raise baby dinosaurs. Stuff ballot boxes. Avoid tar pits. Dragon Jerk – you are a dragon. Use your awesome charisma, magic, ferocity, and resources to mess with the human, elf, dwarf, and orc cities near your lair. Exact tribute, cause inflation, demand youths and maidens, fight heroes and heroines, invest in banks, corner the market, pee in the water supply. You are a dragon jerk! I want Emergency Rescue so much – partly because I've wanted to run it myself – and partly because it would be completely different to anything else about. Yeah, I dig the idea of Emergency Rescue as well, especially because I'm not 100% sure of how to do it. It's high on my list. Sounds like you need to write a few games yourself – those are all great ideas. Laurence: Lady Amelia, Lord Valentine asks for an audience. Lady Amelia: Thank you, Laurence. there needs to be a medic manbot called Robot Hussein. For Deviant Decade you can have a Gangland expansion, because The Warriors is an awesome film!